I’m just going to come out and say it: I love girlie products. I want it all–the hair stuff, the skin stuff, yummy-smelling lotions, loads of makeup, you name it. Bonus if the product itself is pretty, like my teal Lancome eyelash curler or my Nest fragrance bottle. I want daytime moisturizer and night cream, I want my body lotion to complement my soap and if I read about it in a magazine, I’ll most likely give it a whirl. But, about a year ago, I started transitioning to more ‘natural’ products. I use that term loosely, as it has about zero meaning in the cosmetics industry (nor does it in the food industry). For the purpose of this blog post, I’ll use the term ‘natural’ to mean a product formulated with fewer chemicals and one that scores low on the Environmental Working Group’s Skin Deep database (more on that in a minute). I was inspired to make the switch after many talks with my nearest and dearest, Emily, who has been using super-natural (or making her own) products for years now. She does her research, and while I don’t think anyone is going to drop dead while brushing their teeth with Crest, I’d still rather be safe than sorry. In my personal (and admittedly not super educated) opinion, there just hasn’t been enough research done to assess long term affects of some of the common chemicals found in our everyday products that get absorbed through our skin. I don’t want to find out in 30 years that the parabens and phthalates in my shampoo cause cancer, or that lead, arsenic or mercury in my lipstick were terrible for me. What the heck is arsenic doing in my lipstick?? For more on the chemicals in our products, check out Chemicals of Concern at SafeCosmetics.org. Enter EWG’s Skin Deep. It’s a database of thousands of products that each receive a score based on their ingredient label. Emily introduced me to it and they even have an app for your smartphone so you can scan barcodes in-store to see a product’s rating before you buy. Not everything I buy is a 0 or a 1, but I try to keep almost everything at 3 or below. -Burt’s Bees Orange Essence Facial Cleanser: EWG 1, it doesn’t foam AT ALL, but it works like a charm and smells nicely citrus-y. I use it at night and in the morning to cleanse, and keep a separate foaming cleanser in the shower. –Burt’s Bees Body Lotion or Baby Bee Lotion, both fragrance-free: EWG 2, I believe they’re the same formulation and I receive these through an Amazon subscription for bit of a discount. Each bottle is 6 oz and I can go through about 1 per month. I love the scent (it just smells clean, maybe a hint of baby powder?) and the tube is super convenient. -Neutrogena Eye Makeup Remover: EWG 3, I’ve used this particular product for years and have tried Almay’s Oil-Free version (EWG 2) but find it stings my eyes a bit. I plan to try Almay again in the hopes that it won’t sting/I’ll get used to it in order to use a product with a lower rating. –Jason Purifying Tea Tree Gel: EWG 2, this one was hard to find in the database, so I’m not sure the rating I listed is accurate. But, it’s paraben, SLS and phthalate-free, and way cheaper than a tiny tube of Bikini Zone (which is just lidocaine, anyway). I use this post-waxing and it soothes my skin and removes redness almost immediately. Tea tree oil is known for it’s antiseptic properties, and my medical doctor once recommended it for a toe-nail fungus (I hate to admit I must be prone to them) and it worked! No antibiotics needed! Note the small Jason Tea Tree Oil bottle next to my fragrances. –Cetaphil Daily Facial Moisturizer with SPF 15: EWG 2, I’m a firm believer in using sunscreen (my red-haired, freckle-covered father had skin cancer when I was a child), especially on your face. Because my tinted moisturizer also has sunscreen, I don’t use this every day (although I probably should), and tend to use it when I know I’ll be outside a lot. –BAN deodorant/antiperspirant, unscented: EWG 1, I was THRILLED to find this gem. I’m a sweater, and transitioning to a natural deodorant terrified me. I tried a Tom’s of Maine and Kiss My Face formulations, and I was still feeling wet and sticky under my arms. I love that this version is just like what I’m used to (a little white perhaps, but not sticky) and the lack of scent isn’t a problem at all. –ACURE Night Cream: EWG 1, this is an anti-aging product (hey, you can’t start too soon!) I found at our Wegmans and have really loved. They have an entire product line, including hair care and skin care. At $16.99 a tube, it’s not super cheap, but it’s also not what I’d call super expensive either. –Say Yes to Blueberries Age Refresh Eye Firming Treatment: EWG 1, I purchased this INSTEAD OF another product after looking them both up on the EWG database. Love it. -Pureology Hydrate Light Conditioner: EWG 6?? ?, I know when I looked this up 6-9 months ago, it was not a 6. It’s possible I have an old formulation that was rated lower, that has since been replaced. Hmm. Too bad; I LOVE this product. It’s pricey, but it does a great job not weighing my hair down and between the size of the bottle and my short hair length, it lasts awhile. -Paul Mitchell Tea Tree Lemon Sage Thickening Shampoo: EWG 5, man, I’m really striking out in the haircare department! This I can explain: it was an impulse purchase the last time I was placing an Amazon Pantry order. 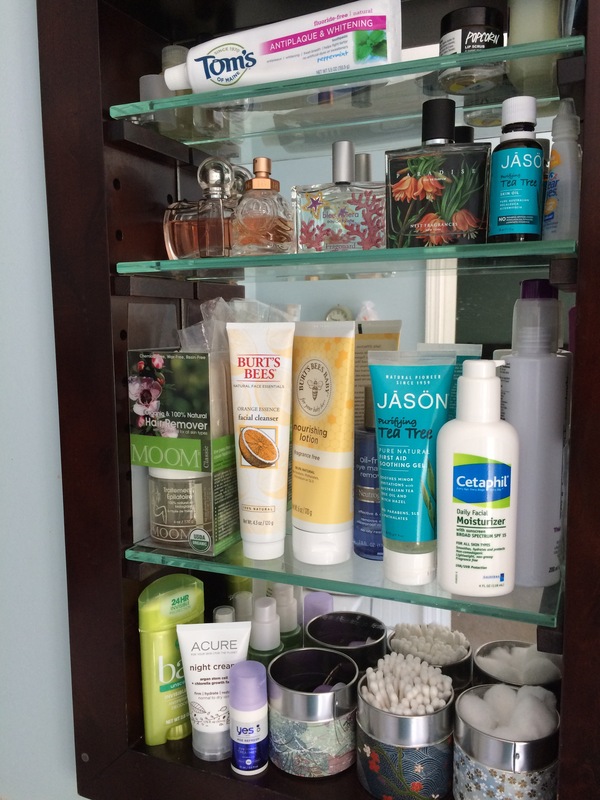 I’ve also tried Kiss My Face Big Body Volumizing Shampoo (EWG 2) and liked it. 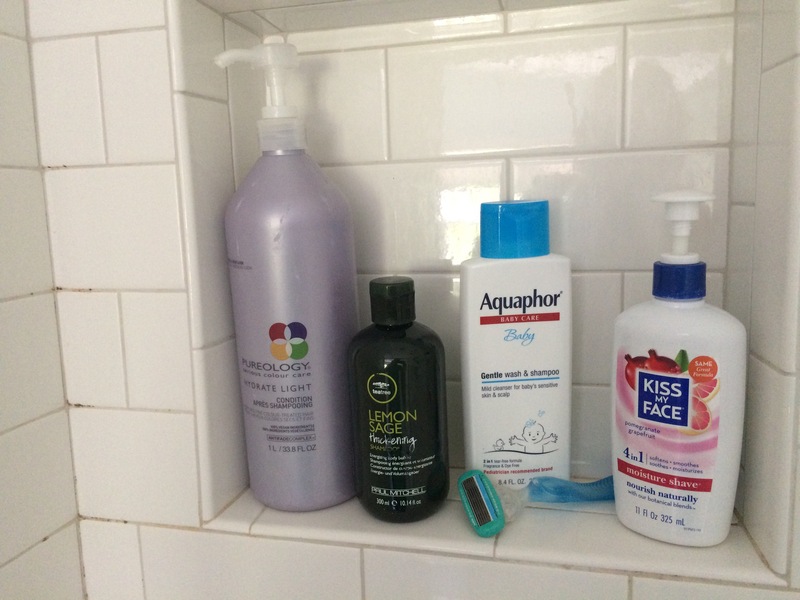 –Aquaphor Baby Gentle Wash and Shampoo: EWG 2, this is a great, simple sudsing face wash.
–Kiss My Face Moisture Shave: EWG 4, I was surprised to find many of the scented varieties and the fragrance-free scored as high as a 4. I have the pomegranate-grapefruit version as it was the only one available in Amazon Pantry at the time, but I intend to go fragrance-free next time I buy. I’ve tried various other natural shaving creams and have been disappointed; I like this one enough to stomach the 4 rating. Well, that’s the tour of my bathroom! Just to keep it real, my makeup and nail polish collections haven’t gone ‘natural’ yet… Thankfully, the tinted moisturizer I swear by (Laura Mercier, EWG 3) has a low rating, as well as many of the BareMinerals products. As for my nail polish? Well, I have just too darn many to start over now! Disclaimer: None of these brands know who I am. I didn’t receive any of these products to try in the mail. This post contains affiliate links. French paradox: Why do so few French women get fat? *Note: this post was originally published on the Refresh blog in August 2015 (link above). The below text was recently re-published in print in the East Aurora Advertiser on May 19, 2016. In honor of my upcoming trip to France, I wanted to revisit the subject of the ‘French Paradox,’ this seemingly mysterious phenomenon that occurs across the pond that allows European beauties to remain slender despite a steady of diet of butter-laced pastries, flaky croissants and wine (and more wine). My book club recently read one such book, appropriately entitled ‘French Women Don’t Get Fat’ by Mireille Guiliano, a French native who spent a semester studying abroad in the US as a teenager and brought back an extra 20 pounds along with her souvenirs upon returning home. I read the book – part memoir, part diet book, part cookbook – cover to cover and embraced every word. Guiliano approached the subject just as you’d expect any proper French woman would – with class and poise and just a dash of humility (remember, she was once in our fat American shoes, too). Just reading the book caused me to slow down, take every word in and actually THINK about the rationale. There was no formula to ‘get thin quick’ (unless you count her recipe for ‘magical leek soup’), there was no skipping to the ‘diet part.’ Instead, she simply explained what French women do, and what they don’t. In short (because this is already getting long-winded), Guiliano writes about the French culture and how it applies to food, and really, life. Our societal differences really do contribute to the size of our waistlines. The French get great pleasure from their food (and wine), but it doesn’t lead to widespread obesity. Why? They approach life in a totally different way; instead of racing around every day trying to do and ‘have it all,’ they tend to enjoy life each day, as it comes. We rush all day long, driving to and from, working, teaching, parenting, chauffeuring, throwing dinner on the table only to repeat it all the next day. The French embrace the journey – the walk to work or school, the food they eat, the activities they find enjoyable. Again, generalizations, but stay with me. Quite simply, French women don’t get fat because they don’t overeat. We’re a nation of overeaters for myriad reasons – mindless eating, emotional eating, eating out of boredom or too fast – and the French do not. They tend to enjoy fresher, local food prepared simply and eaten slowly. While their culture embraces bread and wine, these two American diet taboos don’t make French people fat because they don’t overindulge. Everything in moderation. Guiliano approaches weight loss in the book as a three-month ‘recalibration’ process, during which she recommends writing down your daily intake (even easier these days with smartphone apps) and then identifying what needs to change in your diet to lose weight. She credits ‘ Dr. Miracle,’ her childhood pediatrician, for helping her address her own weight gain through these methods. For Guiliano, that meant taking another route to university upon returning to Paris in order to avoid the countless bakeries with their sweet smells. Despite being French, she had picked up some indulgent taste buds while in America and continued her over-indulging after returning home. With a three-month ‘recalibration’ period, this is no ‘quick fix’ book. It is, however, an enjoyable read that may in fact help readers identify areas of their own lives that need some ‘recalibration.’ For me, it was a gentle reminder to eat more slowly, enjoy my food, and only indulge in worthwhile splurges (like a really good piece of cake) and pass on only so-so treats (a store-bought cookie or a second slice of bread at dinner). Having traveled abroad a few times over the years, I can say with absolute certainty that the assertions Guiliano makes are true. Sure, there are some round French women just as there are slender Americans, but the cultural nuances are accurate. Want to be thin like the French? It’s simple: eat to live, don’t live to eat. Holly R. Layer is a Registered Dietitian and a freelance writer. She also provides nutritional counseling at Weigel Health Center at Buffalo State College and teaches fitness classes at the Southtowns YMCA. She lives in the village with her husband, Andrew, an East Aurora native. She enjoys working out, reading, baking and talking about anything food-related. She blogs at www.thehealthypineapple.com and her work appears monthly in the Refresh Buffalo Blog. Questions to Holly can be emailed to eanews@eastaurorany.com. Andrew and I have been members of the co-op since we moved here in 2011, and it’s been a looooooong project that many people have worked very hard on for the last five years or so. For more information about the co-op, including it’s history and how to become a member (we always need more members! ), go to their website at http://eastaurorafood.coop/. 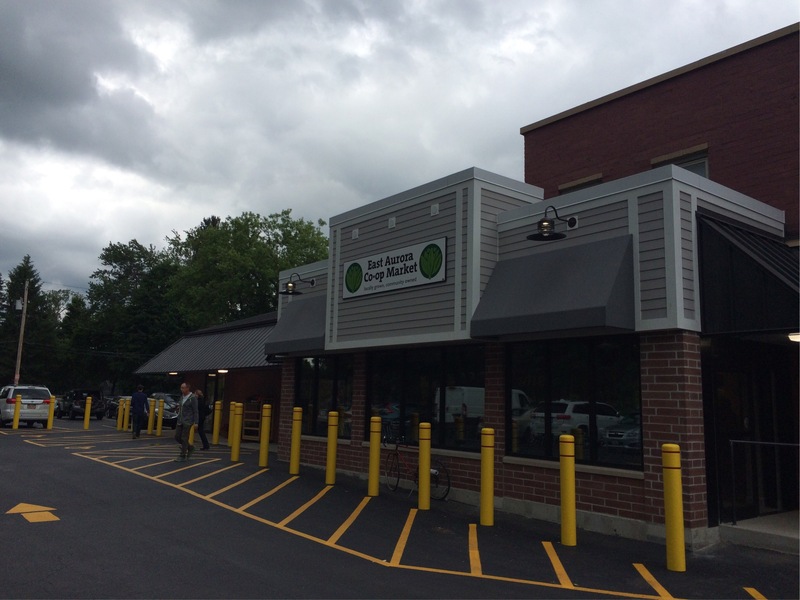 The co-op carries the same things as a regular grocery store, such as salad dressings, condiments, baking supplies, fresh and frozen foods, as well as bulk bins for grains and even spices. While you won’t find Campbell’s soups, you’ll find Amy’s and other high-quality brands throughout the store. 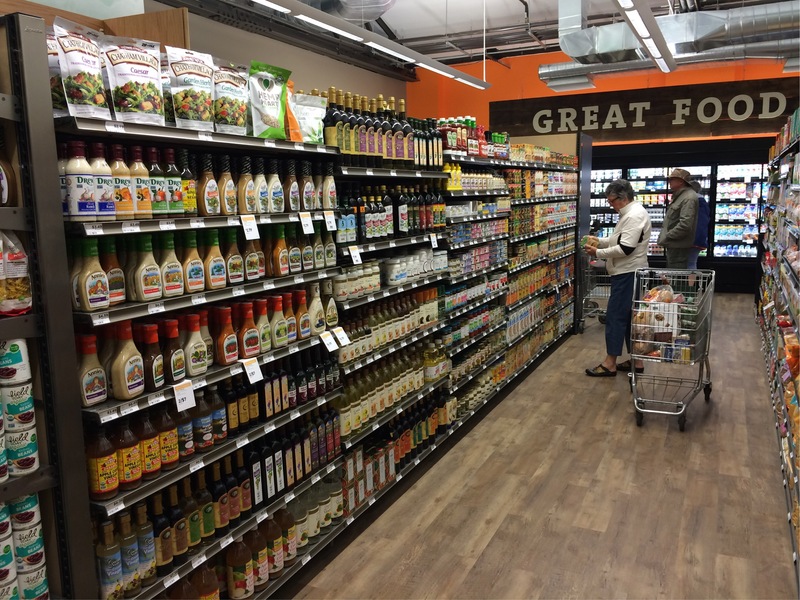 Annie’s dressings and crackers and macaroni and cheese, Newman’s Own cookies, Udi’s gluten-free bread and Barbara’s cereals are just a few of the common brands you’ll find at the co-op. Looking for your best value? Try Field Day, which is like the ‘store brand’ for co-ops. Great quality at great prices! 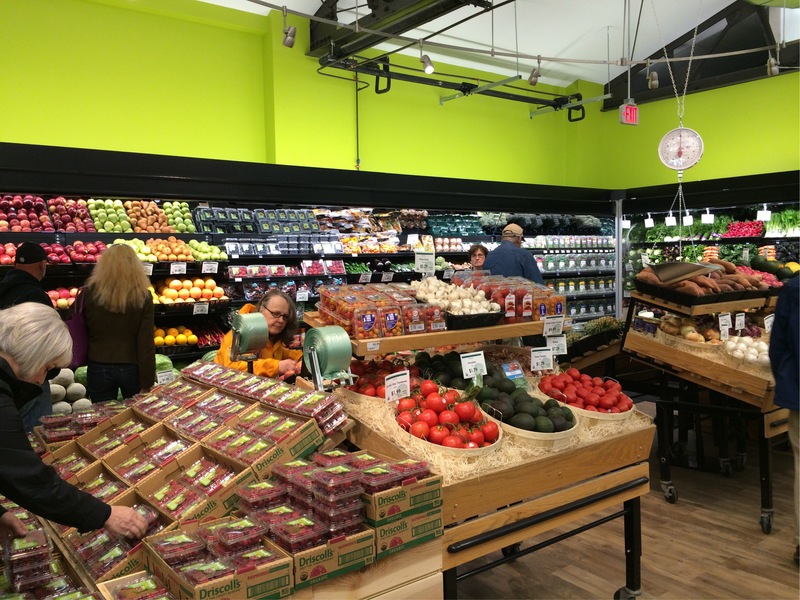 The produce section will feature as much local food as possible. 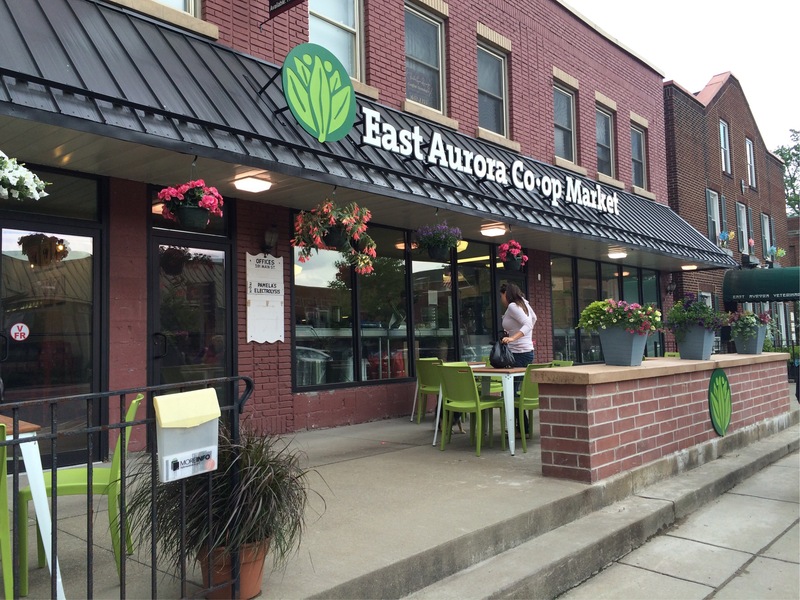 With the co-op just having opened, it may take a little while to maximize local sources, but that is the goal. 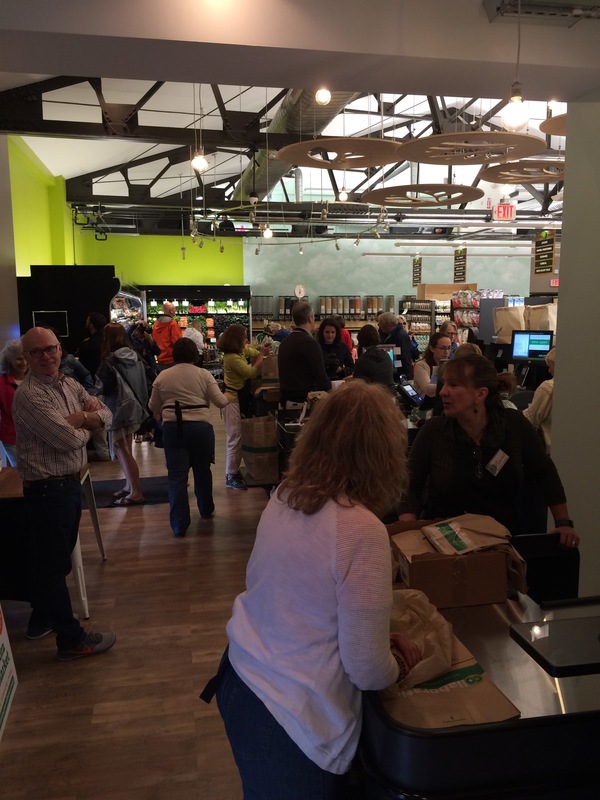 With summer finally here, it shouldn’t be long for the shelves to be full of local produce! I love the interior design of the co-op, done by local artist Alix Martin. The walls are bright green and orange for energy, with soft blue skies and clouds to balance it all out. 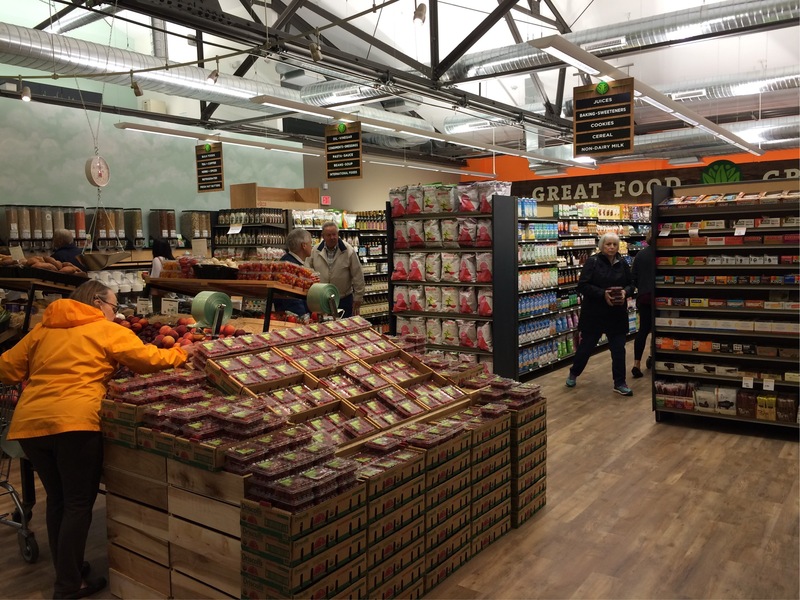 The wood floors are perfect for the ‘natural’ feel, and exposed beams and electrical give the store a modern vibe. I’m excited! If you’re local, give the prepared foods department a try and sit out on the patio on a nice day. Pick up some of your favorites to bring home for later. Consider becoming a member today!